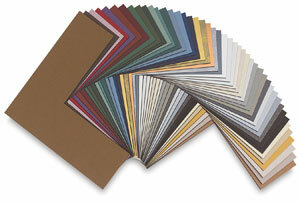 These classic matboards have a fine-quality surface paper that is highly fade-resistant and bleed-resistant. The white core is made of unprinted, reclaimed wood pulp fibers and, along with the backing paper, is buffered and acid free. Individual boards are 4-ply, .052"–.060" (1.3 to 1.5 mm) thick.